FortiGate-VM for Google Cloud Marketplace supports using the FortiGate Clustering Protocol (FGCP) in unicast form to provide an active-passive clustering solution for deployments in GCP. This feature shares a majority of the functionality, including configuration and session synchronization, that FGCP on FortiGate hardware provides with key changes to support GCP software-defined networking (SDN). 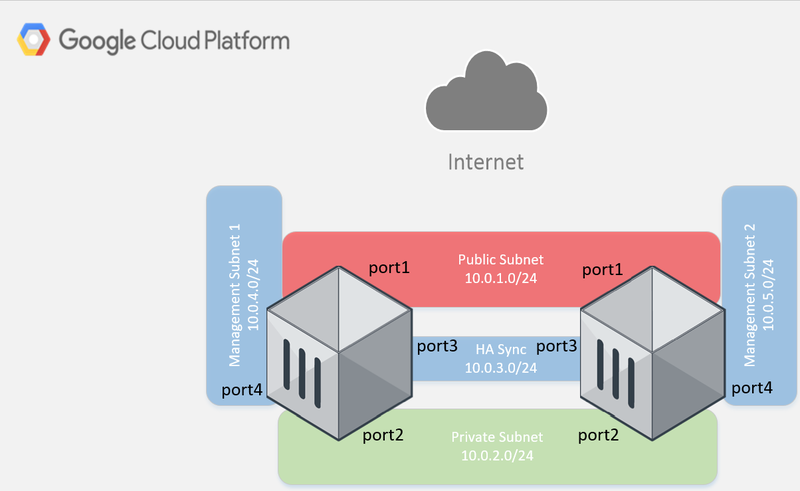 This solution works with two FortiGate instances configured as a primary and secondary pair, and requires that you deploy each instance with four network interfaces, within the same availability zone. These FortiGate instances act as a single logical instance and share interface IP addressing. Using the GCP GUI console. See Deploying FortiGate HA using the GCP GUI. Using Google Cloud command interface. See Deploying FortiGate HA using the Google Cloud command interface. For information on FGCP, see the High Availability chapter in the FortiOS Handbook.